If you thought that rubbing your makeup off with cleanser and water at night and smearing on some moisturizer meant that you’ve taken care of your skin, think again. While we commend you for removing your makeup and hydrating, using a haphazard application process isn’t cutting it. And though it may seem meticulous, applying the right products in the correct direction and order will greatly impact their efficacy. Have we lost you yet? We hope not. We completely get that it may seem like we’re adding more time to your routine, but trust us when we say that being more conscientious about your methodology and essentially adopting the habits of a facialist when you apply your products will yield a brighter, more youthful complexion. As such, we turned to renowned celebrity esthetician, Renée Rouleau for her exact skincare process. Below, she sounds off on her full morning and evening routines. The general rule is to apply thinnest to thickest. The last step should be with a moisturizer that will act as a protective sealant to hold the other products into the skin. Cleanser: I use a non-drying, foaming, sulfate-free gel cleanser in the morning applied to damp skin in circular motions. Toner: I always use a toner post-cleansing, which is the same consistency as water, applied with Toning Cloths ($15). This removes impure tap water and offers additional benefits (like inducing a glow when I use this one), but when left damp on the skin right before applying serum, it not only gives my skin a boost of hydration, but damp skin is also 10% more permeable so that serum can penetrate deeper for maximum results. Serum: I apply a few drops of serum to my fingertips and rub them together with the opposite fingers, and then I apply an even amount to my face and neck [Byrdie loves Pestel and Mortar Pure Hyaluronic Serum, $69]. It’s important to not apply as dots of product directly to the face since dabbing on dots of serum and rubbing them in can give a concentrated dose in those specific areas before they are rubbed onto the rest of the face, which can cause irritation if it’s an acid or retinol. As for how I apply serum, I always use a pressing technique to get it into my skin. All the French estheticians do this, and I love learning from them when I’m over there. The concept behind pressing it into the skin is that you’re essentially pushing it into the skin, which may help enhance absorption. Sunscreen: My favorite sunscreen is Daily Protection SPF 30 ($39), and I do two applications—one to the face and one to the neck. The reason for this is because sunscreen is not so much about the number but rather how generously you apply it, and since the neck is an extension of the face, I protect this area to keep it looking its best. I take a quarter-size amount of sunscreen, and I first apply it to my neck area in upward strokes to the front of the neck, and then, working sideways, I apply to the sides of the neck, all the way to the hairline in the back of my head. This will ensure that I am covering all exposed areas well. Then, I do a second application to my face. I apply a nickel-size amount to my fingertips, rub it together, and then starting from the sides of my nose outward to my ears, I apply it generously. Then I apply it to the forehead, nose, chin, and upper lip area. Cleanser: In the evening, I always use a cleansing lotion since the emollients melt down the emollients often used in foundation formulas, so you dissolve makeup away. [Ed. note: Try Mario Badescu Cucumber Cleansing Lotion, $15.] I apply it to dry skin first (not damp) to ensure the cleansing lotion attracts the makeup. I massage it into my skin for 45 seconds, I wet my fingertips, work it through again, and then I rinse off with lukewarm water. I then use a baby washcloth (since it’s so gentle) to wipe over my skin to ensure the makeup gets lifted off. Night moisturizer: When applying a moisturizer over my serum, I always massage it into my skin first with my fingertips. Then I immediately close my fist and, using circular motions with my knuckles, I give my face a 90-second face massage. This helps to increase blood flow and encourage lymphatic drainage to ease puffiness. Eye cream: I always use a patting motion, and I never get too close to my eyes. Did you know that every time you blink, your lashes lift microscopic amounts of eye cream, which can deposit into the eyes causing irritation and unnecessary puffiness? Right before bedtime, I hang my head upside down over the side of my bed for three minutes to bring a boost of circulation and increased oxygen to my skin for the ultimate beauty sleep. 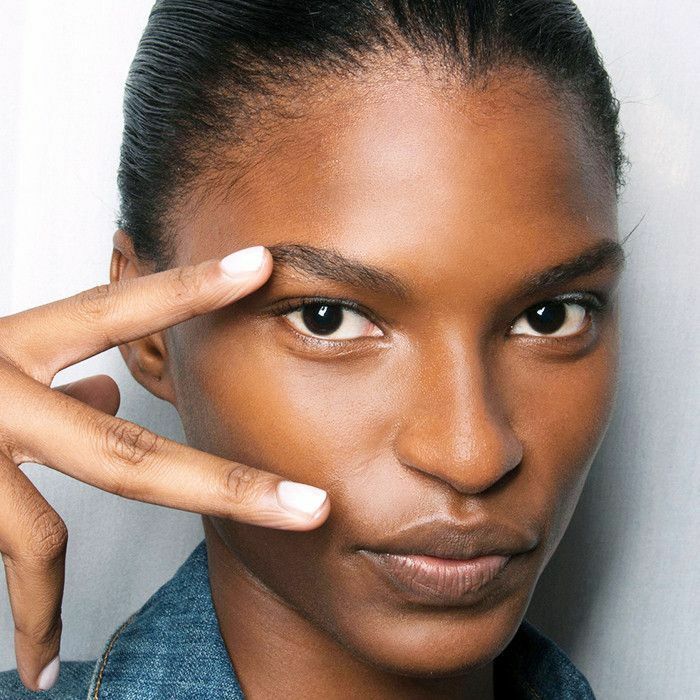 Next up, check out the clear-skin tips estheticians swear by.